Skin and bones can be an architectural term, with ‘skin’ referring to the material used for the building’s exterior, and ‘bones’, the basic structure within. Early design sketches of the new Reid building for The Glasgow School of Art (GSA), by architect Steven Holl, compare the skin and bones of the Mackintosh building with that of its new neighbour. In the design process, the two buildings were denoted as binary; a thick skin of brick for the Mackintosh versus a thin skin of recycled glass for the Reid; then thin wooden bones of the former versus thick concrete bones of the latter. 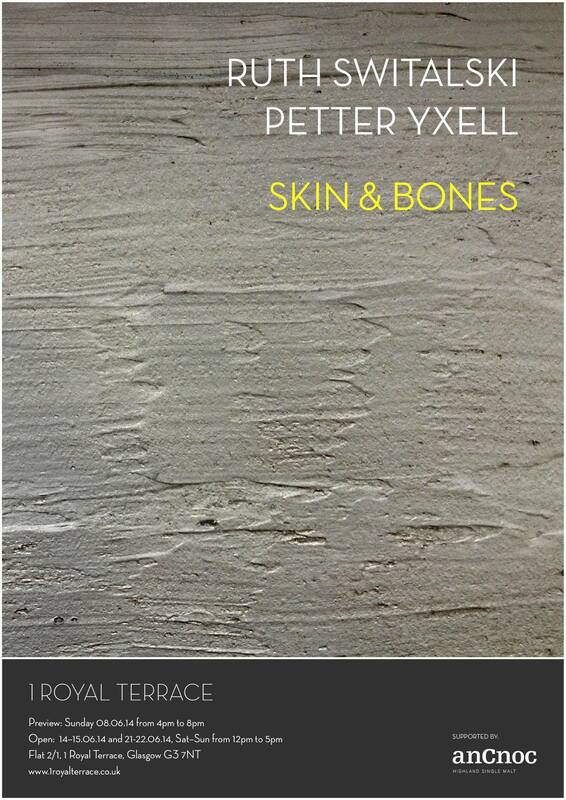 The exhibition ‘Skin & Bones‘ (8.6.14-22.6.14) is a ten minute walk from the GSA. It takes place in the airy and generously proportioned front room of a domestic tenement built in 1777 which has been repurposed as a gallery for a six-month long exhibitions programme. 1 Royal Terrace is located at the beginning of the West End. The gallery windows overlook Kelvingrove Park, which was established by the City between 1852 and 1854 to be one of a series of parks to combat the ‘skin and bones’ condition of the masses, following the Industrial Revolution. 1 Royal Terrace‘s closest contemporary gallery neighbour, is The Common Guild , the latter to be found on the higher ground of Park Circus, built for the upper classes to reside up wind of the factories, in the cleaner air. 1 Royal Terrace resides in the middle ground. 1 Royal Terrace is, historically speaking, not the only gallery to have sprung up from a domestic space or to reference the domestic realm as a more natural place for experiencing art. ‘At Homes‘ was a series of performance and musical events that The Glasgow School of Art Club organized in the late 19th Century and early 20th Century, allowing for informal collaboration and gatherings within institutional exhibitions. Events included ‘Conversazione‘ in 1901 at The Royal Glasgow Institute of Fine Arts, on Sauchiehall Street, created a more informal space for group gatherings, in the gallery setting. A second example, The Gallery of Modern Art Glasgow, was originally a townhouse built for £10,000 by ‘Tobacco Lord’ William Cunninghame (1731-1799), the year after 1 Royal Terrace was built, in 1778. He renamed the street outside to match the tenor of his new residence- Cow Loan became Queen Street- after George III’s wife. Cunninghame then sold his townhouse to the Royal Bank of Scotland; when the bank moved the building became a business centre and exchange, which was when the Corinthian pillars were added; then a library established by Glasgow Merchant Walter Stirling; then in 1996, finally, a gallery for the City’s collections. The changing functions of the one building breathed different lives into it. The six month long exhibitions programme at 1 Royal Terrace, should be viewed in its entirety on the same terms as ‘incremental building’. This exhibition ‘Skin & Bones‘, by the gallery co-founders and curators Ruth Switalski and Petter Yxell, is the concluding iteration of six exhibitions. Rather than jar as an example of curators curating themselves, it is the fitting conclusion that mirrors the close conversations between firstly Switalski and Yxell, then with each of the five solo practitioners they selected . Instead of treating the gallery space as a tabula rasa for each show, the programming of 1 Royal Terrace has purposefully allowed a flow between the shows of artists that didn’t necessarily know each other well; from Helen Shaddock’s bright low-rise ‘Gathering‘ of parquet tile sized colour casts to the slowly discernible objects from the darkness of Augustus Veinoglou’s ‘Below the Spillway‘. The curators placed an emphasis on the solo show format, as one they perceived to be missing for emergent practitioners. 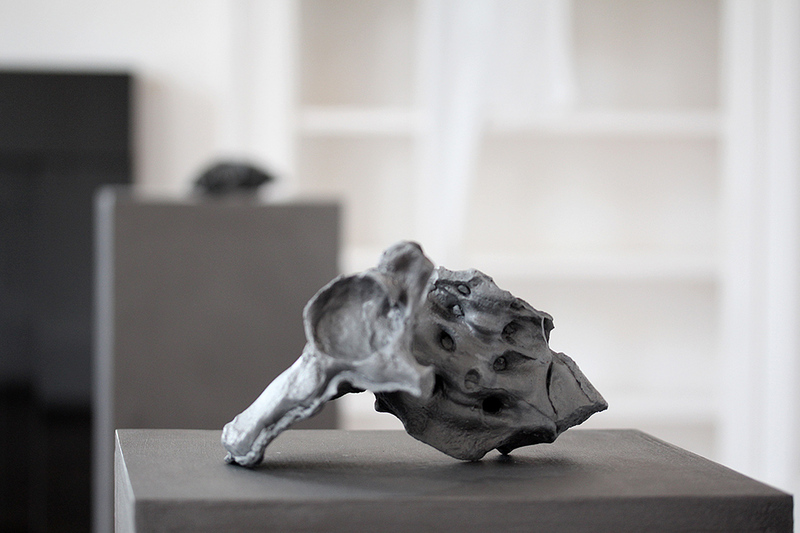 The majority of the practitioners also utilise the casting process in their work, with each show exploring materials. A key objective cited by the curators of 1 Royal Terrace has been to foster a group of artists who were predominantly ‘outside’ the Glasgow ‘scene’ and to provide a professional platform complete with website and print, all undertaken by Switalski and Yxell so not outsourced. Perhaps a distant echo of the ‘At Homes‘ series of last century Glasgow School of Art Club, a series of open conversations with the 1 Royal Terrace artists has also punctuated the duration of each exhibition; its regularity allowing for overlaps between each of the involved practitioners to find out and consider how each has responded to the opportunity. 1 Royal Terrace architecturally echoes aspects of the ‘white cube’. Brian O’Doherty in ‘Inside the White Cube; The Ideology of the Gallery Space’ (1976)  explores the genesis of the gallery into a white cube- “The ideal gallery subtracts from the artwork all cues that interfere with the fact that it is ‘art’.”  White walls, uniform floor, no windows- these elements become part of the equation for this room to become ‘’a placeless gallery”. However, the gallery in a flat operates within a ‘place’, the domestic realm, which lies beyond. As a room it can be formalized, through emptying it of recognizable objects. It may also take on a number of the accepted givens of a gallery, in the case of 1 Royal Terrace, which places itself through address, the gallery adopts the clear language of white walls, gallery lighting, parquet flooring. However, this type of gallery is on the terms of the occupation of the owner and collaborators. It also places itself in a network; as a mode of activity this model has credence and is accepted in the wider art scene of the city. The ideology of the gallery in a flat lies in its immediacy and possible economy. The artist need not wait to attain visibility by being picked up or invited by an institution. The individual can become owner occupier of their own production, and that of invited others who cross its threshold. As a model, it makes artwork visible in a vital way. For the audience, there is an intimacy with the work and the host. Whilst ‘Skin and Bones’ exists in a domestic interior, with works referring to materials that relate to buildings and the body, this exhibition retains an edited formality which suits the nature of the gallery space created at 1 Royal Terrace. The precision and editing of the works, follow the tradition of a Modernist hang; allowing the objects to breathe with plenty of white space around. Switalski and Yxell talk of having had to negotiate the space of the room as the first two person show to inhabit it, following five solo presentations. This is quite literally seen in the division of space that Yxell’s work I know where my bones are buried creates, with the placement of six scaffolding planks, standing elegantly between floor and ceiling, to take on the volume of the space. In visual detail, reminiscent of Roger Ackling’s (1947-2014) simple wooden works where sunlight was angled onto surfaces through a hand held magnifying glass to burn the surface, Yxell instead uses a blow torch to char simple areas on the top of each piece of pine board. There is no space between the gallery wall and the ‘skin’ of Switalski’s work. Its surface holds the painterly marks of its application. ‘Stratum Coneum‘ covers the surface of the dividing wall between the gallery and the domestic apartment that lies beyond, providing an interface between the hidden ‘id’ of life in the apartment, and the presentable ‘ego’ of the gallery as a rational and controlled container of objects for audience perusal. This ‘ego’ is very much the opposite to Erica Eyres and Sigga Bjorg Sigurdardottir’s 2014 Glasgow International presentation ‘Sniffer‘, where the ‘Id’ of the protagonist, detailed as having been ‘abandoned by his parents at an early age’ (a more physical type of abandonment than Plath experienced), roams uncontrollably through a filmic and object installation in a Victorian tenement apartment on Alexandra Parade, in the east end. Sniffer’s Freudian ‘drive’ sees him stalk an unseen prey and also, through a separate film, the viewer able to see the grotesque ‘skin’ of his hand, leaf delicately through a jewelry catalogue. 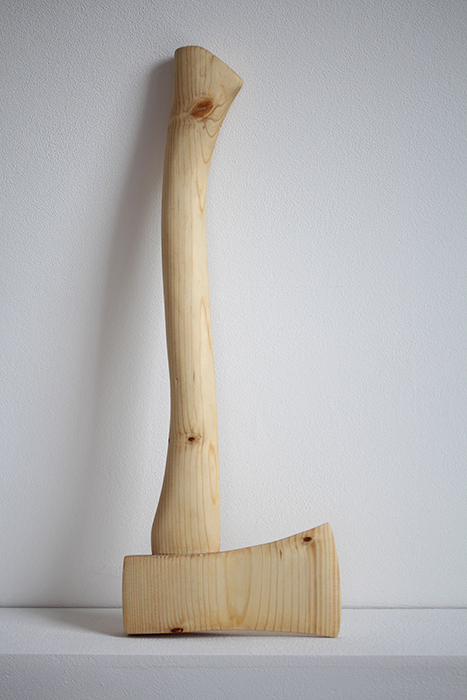 Yxell’s ‘In advance of a broken line‘ (2014) creates an axe made from wood, fusing this elemental manmade tool with the material it has been invented to deal with. Using this work’s title as a metaphor, where and how does 1 Royal Terrace sit in the lineage of other examples of recent and past manifestations of galleries occupying domestic spaces? A defining feature of grassroots activity in the contemporary visual arts scene in Glasgow has been the proliferation of galleries within domestic flats. It should be noted that within Scotland this is not purely a Glasgow phenomenon, with examples such as ‘Annuale’ in Edinburgh (2009-) often taking place in flats, or Magnifitat (2002-2007) set up by Kim Coleman and Jenny Hogarth in a flat in Bruntsfield, Edinburgh. The home as a site for artist work and studio is also well documented. A concise, detailed narrative of US and European examples is recorded in the excellent Sternberg Press publication, ‘The Artist’s House: from workplace to artwork‘ by Kirsty Bell (2013). ‘In advance of a broken line’ (2014) Petter Yxell. Image courtesy 1 Royal Terrace. 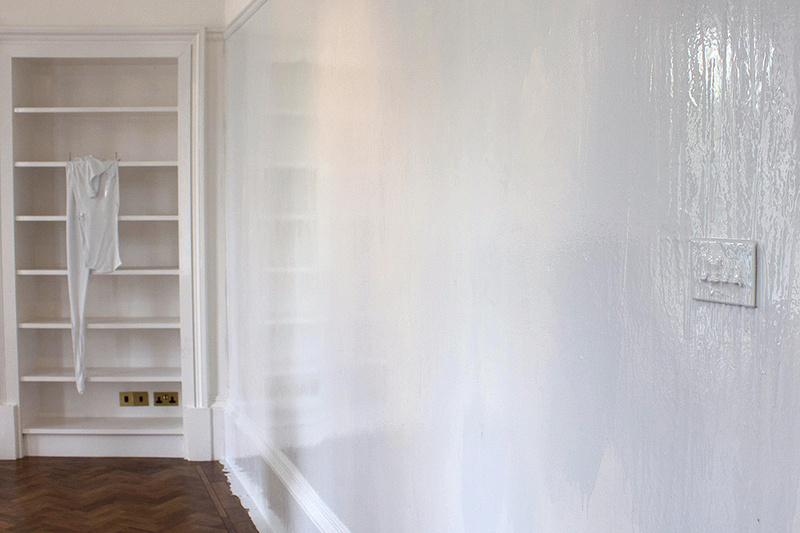 Back in Glasgow, over the last twenty years, key examples have included Cathy Wilkes’ Wilkes Gallery (1995-7) in a spare room in her ‘flat in the Dalriada tower-block in Anderston’ , to the origins of Mary Mary, established by Hannah Robinson in her corner flat with views on Alexandra Parade in Dennistoun. Switchspace, ran by Sorcha Dallas and Marianne Greated (1999-2004) began in Dallas’s west end flat then, through partnerships with the city and an interested property developer, created opportunities for artists in a series of newly renovated empty flats. This format of a gallery in a domestic interior has been an immediate, flexible and independent means to create a space for making work and showing it. As co-founders, Switalski and Yxell were very aware of the lineage of such spaces in Glasgow, and have seen 1 Royal Terrace as “adding to the historical heritage of an [art] scene so rather than ignore or find a gap, we have updated the model” . In choosing in 2014 to make a gallery within a private dwelling, Switalski joked that they wanted it, “… not to feel like it has an outdated 90s’ house party vibe“. As a model of self-sufficiency and signifier of independent activity, the gallery in a domestic dwelling has continued to endure, in particular, in its appeal for students and recent graduates. Examples from the recent present include ‘Friends’ (2013-), at 42 Charlton Place, by the river Clyde, run by GSA MFA graduate Lauren Hall. rez-de-chaussée  on Woodlands Drive, led by five GSA MFA students, existed for a year in 2011, in a front room of a flat on Woodlands Road in the west end of Glasgow. To compare 1 Royal Terrace to an enterprise which has ran separately yet concurrently in Glasgow, ‘Friends‘, some formal differences arise in approaches. For Lauren Hall, ‘Friends are pals’, which has led to an organic series of solo presentations and collaborations with immediate peers in the domestic flat she rents. For 1 Royal Terrace, a main premise of selecting the artists for the six monthly shows, was that they would not necessarily know each other and were predominantly chosen as they are outside the perceived Glasgow art scene. Formally, the front room of 1 Royal Terrace has been transformed into a room that reads successfully as a high spec gallery space, with its specially installed lighting and synonymous white walls. For ‘Comfortably Warm’, Hall’s 2014 collaborative Glasgow International project with Jay Mosher, the domestic life and nature of the flat, even when reduced through the process of emptying out all furniture and belongings, could not be eradicated. The life of an independent gallery in a flat is often a finite one. Such initiatives have lived, breathed, altered shape, and had different lengths of life span. The evolving nature of technology and social media since the 1990s’ may help to serve these recent enterprises better with a more visible afterlife of documentation on the web. The form of the projects they house and the duration of the entity are closely intertwined with the paths and individual trajectories of the artists who have ran them. The gallery may flex into another kind of enterprise, for example, when awarded funding, or more likely be closely tied to the tenure of the location; if rented property, or a conclusion in education, the person moves on. Individuals also may chose to focus solely on their own practice again. In 2014, as Switalski has concluded her Masters of Letters at The Glasgow School of Art, and Yxell moves to London to do an MFA at Goldsmiths, the activities of 1 Royal Terrace, following a conclusive and finite six month run, the initiative is in abeyance to see what naturally arises from the protagonists’ own trajectories. The Common Guild was established in 2006, and is a charitable, not-for-profit organisation, originating from the development of The Modern Institute as the latter evolved fully into a commercial enterprise. The Common Guild is sited in Douglas Gordon’s Glasgow house. 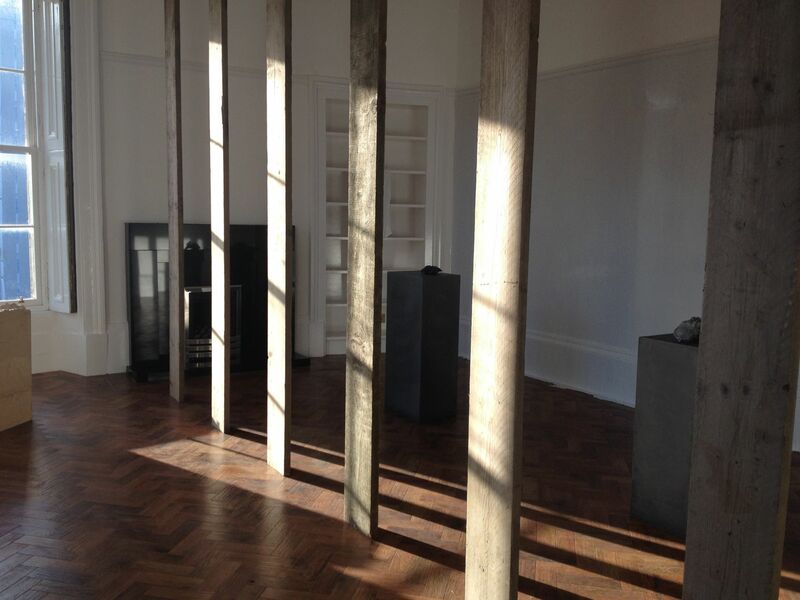 The exhibitions at 1 Royal Terrace have been Helen Shaddock (‘Brimming’), Nick Thomas (‘Quote Spam’), Rachel Levine (‘Here, Create distance, Tension It… Feel It Flex’), Augustus Veinoglou (‘Below the Spillway’), Caroline Inkle (‘Re:Production’) and Ruth Switalski / Peter Yxell (‘Skin & Bones’). Whilst 1Royal Terrace have had a cohesive website knowingly reminiscent of an organizational website with archive section and new section, ‘Friends‘ has moved out from a website as starting point, to individual Tumblr platforms for each project, which operate as a holding page of abstract images to represent ideas and processes. This entry was posted in Writing and tagged 1 Royal Terrace Glasgow, Augustus Veinoglou, Erica Eyres, Friends Glasgow, Helen Shaddock, Lauren Hall, Petter Yxell, rez-de-chaussée, Ruth Switalski, Sigga Bjorg Sigurdardottir. Bookmark the permalink.